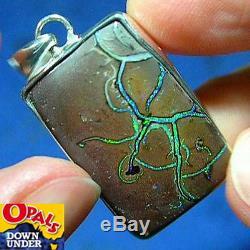 Silver Beautiful Greens 44ct Natural Aust Solid Yowah Boulder Opal Pendant. 34.1mm x 19.5mm x 6.0mm thick. This natural australian solid yowah boulder opal pendant has beautiful colors of green and violet which fill the veins between the stone. There is some flicker of color with movement of the opal. The opal has been set in solid sterling silver (stamped 925). The pendant comes with a top quality black greek leathercord and is ready to be worn. We pride ourselves in offering you boulder opal with bright gem colours. We go the extra mile to offer top quality opals in all price ranges. The item "Silver Beautiful Greens 44ct Natural Aust Solid Yowah Boulder Opal Pendant" is in sale since Monday, December 4, 2017. This item is in the category "Jewelry & Watches\Fine Jewelry\Fine Necklaces & Pendants\Gemstone". The seller is "opals-downunder" and is located in Menai, NSW.